Jack Edwards returned from suspension to face Bedworth but was lucky to escape another red card. Paul Holleran has blamed Leamington’s poor bank holiday return on their opening week defeat at St Neots. A promising start to the season hit the buffers at Biggleswade with Jake Jones and Rob Ogleby seeing red in a 3-2 defeat. Brakes then went on to draw 0-0 at home to rock-bottom Bedworth United in an instantly forgettable clash on Monday afternoon and Holleran said the ramifications of the two red cards at St Neots are still being felt. 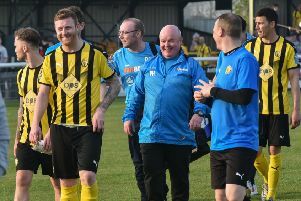 “We’ve had four players sent off now and it isn’t just the game we lost but the shape of the team in the games to come,” said Holleran who was without the suspended Joe Magunda and Jack Edwards for the trip to Biggleswade. Holleran refuted the allegation Brakes were a dirty team, however, but did accept they had to improve their disciplinary record. “We’ve been unlucky with a few decisions but in the main they have been very silly, very petulant red cards. “You only have to look at the Premiership with the amount of players that are getting sent off. “The referees come back from their summer refresher courses and I warn the players in the first month. You also get linesmen who want to referee games. Edwards returned from suspension to face Bedworth on Monday but was withdrawn after being singled out by the visitors’ players and bench following a yellow card. The midfielder cut a frustrated figure on the sidelines but Holleran said it was a problem of his own making. “Jack’s first booking was for getting involved in a situation he didn’t need to get involved in. “He needs to get control of his emotions. Brakes travel to Dunstable tomorrow.